It was a banner week for stupid opinion pieces about Apple. Indeed, the Macalope had a hard time narrowing the field. He did eventually pick two lucky winners, but he’d like to assure all the silly pundits who auditioned that they did horrible, horrible work and even though they didn’t get selected, they should still feel terrible about themselves. Before we wade into the muck, though, who wants to dance…with Microsoft?! 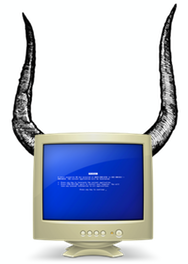 Not a lot of people realize this, but there is a Microsoft equivalent of the Macalope. It’s true. A mythical creature that represents the interests of Windows boosters, if you can imagine such a thing. He’s called the Winotaur—part Windows, part Minotaur—and the Macalope called him up the other day to talk about this video of employees dancing at a Microsoft Store. WINOTAUR: Oh, it’s Mr. Tiny Marketshare! Hey, little guy! MACALOPE: Yeah, two words: Zune nation. MACALOPE: Whatever. Hey, the Macalope saw that awesome video of the line dancing at the Microsoft Store the other day. That was…something. WINOTAUR: Oh, jeez, still with the third person? Get over yourself. But, yeah, good stuff, right? Your boys should try a little theater. MACALOPE: Well, they would, but they’re more concerned with actually selling stuff and helping people and it’s hard to do that when you’re dancing like you’ve never danced before. Literally. WINOTAUR: It’s called “viral marketing”, home slice. Look it up. You think that guy who took the video just happened to be there when they were dancing? WINOTAUR: Yeah, well, he wasn’t. That video’s been viewed about a million times and now what’s the first thing those viewers think of when they think of the Microsoft Store? MACALOPE: 8-Sided Dice Throwers on Ice? MACALOPE: Oh! Oh! The humiliation of working retail?! WINOTAUR: NO! FUN! THEY THINK OF FUN! MACALOPE: Ha-ha! Right. Hey, you might want to look into the labor laws because the Macalope thinks there’s something in there about forcing employees to do things that are humiliating or degrading to their person. Pretty much all of our conversations end with one of us angrily hanging up. Our first flaming hunk of poop in a bag comes from the Inquirer’s Nick Farrell who declares the Motorola Droid is a major threat to Apple. It’s not that the Macalope doesn’t agree with the headline—he does think the Droid is going to be competitive—it’s the lengths that Farrell goes to in order to prop up his argument. Apparently, you see, while the Droid only shipped 250,000 units in its first week, compared to 1.6 million for the iPhone 3GS, Droid units are worth more because bladdity blooga bleega. However the Iphone [sic] 3GS was building upon a massive base of brainwashed Apple fanboys whipped into a frenzy by the tame Apple press vying to show Steve how loyal they were to the faith. But guess what? They still count. The Macalope is perusing the market share numbers (disclosure: he’s not really perusing the market share numbers) and, no, he doesn’t see where “Apple fanboys” get removed because “that’s just not fair.” And, by your own fancifully-stupid argument, they will buy anything Steve Jobs tells them to buy so…advantage Apple! If you’re going to come up with a tired, lazy argument, at least have your tired, lazy argument be logically consistent. Andriod [sic] app development however is unlimited. Even the operating system itself is up for grabs for new and exciting development that does not have to go through the autocratic hierarchy of Jobs’ Mob. If users do not like the fact that their Android phone can’t play HD games or other entertainment then there will be a developer who will knock out code that can do all of that. Yes! And all the apps will work on all the Android phones, no matter what hack a developer puts in place and no matter what the peculiarities of the individual hardware are, right? It’ll all just work and there will be puppies and kittens and it’ll be spring all the time with the dancing and the maypoles and unicorns a-plenty! Right? Hellooooo? Is this thing on? Look, the Macalope has real complaints about the App Store, but they’re all from the developer’s perspective. From the customer’s perspective, it’s like getting sprayed in the face with a fire hose of 99-cent apps. Developers may hate it, but customers love it and developers will go where the customers are. Cheesy, tired, lazy strawman arguments notwithstanding. Oh, and calling “open source” “open sauce”? Just stop. The always-wrong Scott Moritz continues his unbeaten streak in being wrong when opening his mouth and talking about Apple. What they need is something to succeed where the iPod and the iPhone are starting to slow down or peak. The iPhone is slowing down or peaking? This iPhone? Most disturbing, though, is that apparently someone who emits rays of stupidium can actually infect those around them, as Scott’s interviewer apparently has succumbed to his deleterious effects. And Apple keeps pushing back the [tablet] launch date. What does that tell us? That you live a rich fantasy life in which everything you read on the Internet is completely true? Please, if you come in contact with someone who’s been infected by stupidium, do not go near them. Contact professionals in the health services field so that those exposed can be isolated for the well-being of the community. Thank you.